Facebook marketing and remarketing are some of the most powerful marketing tools available. They let you reach your audience where they are. When you consider that Facebook has over a billion users every day, it’s easy to see why Facebook is a good choice of where to spend your advertising dollars. 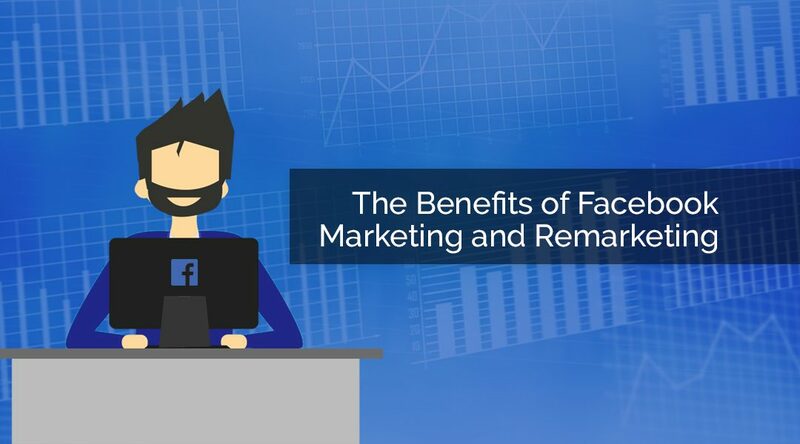 In this article, we’ll look at the top 23 benefits of Facebook marketing and remarketing. Facebook marketing is Facebook’s ad platform that gives you full control over who you reach, how you reach them, and how much you spend to reach them. It’s intuitive and cost-effective. Facebook remarketing is a specific type of Facebook ad that targets those that have previously visited your website. It uses a tracking cookie, called a Facebook Pixel, to identify who to show the ad to. Target previous visitors based on their behavior such as those that visited a specific page, haven’t visited in a while, or left something in their cart. Here’s our list of the top benefits of using both Facebook marketing and remarketing. 1. Your ads appear where customers are. Over 1 billion people per day spend time on Facebook. Many of them check Facebook multiple times throughout the day. Chances are high that you’ll find customers on Facebook. 2. You can create campaigns with the level of detail and objectives you want. Create campaigns for brand awareness, reach, traffic, engagement, app installations, video reviews, lead generation, messages, conversions, catalog sales, or store visits. 3. Facebook Pixel allows you to target a specific audience. You can customize the audience. The audience can be someone from your email list, someone that visited a specific page, someone that hasn’t visited your website for a certain amount of time, etc. You reach the exact audience you want to reach. 4. Your ads appear within their Facebook feed. Your ads will display where the visitor is the most likely to see them. Displaying within their feed ensures they’ll see the ad along with everything else. It looks like a post, so they’re not automatically ignored. This also means that you’re targeting them where they are. Often, visitors only have so much time to spend online and Facebook is one of the most popular places to spend that time. 5. Facebook visitors are already engaging with posts. When they see your ad they can engage with it just like any post on Facebook. Facebook ads can be interacted with. Since that’s what visitors are on Facebook for, you have a better chance that they will follow through to your call to action. 6. They raise awareness of your brand. Since the ads appear within their feed, they’re more likely to see your brand. It can raise awareness of your Facebook page or an external website. 7. It raises the perception of your brand. When Facebook visitors see your brand within their feed they perceive that your brand is large and has a large following. This is especially true if they see it on multiple platforms such as Facebook and Instagram, and if they’re already email subscribers. 8. It provides another way to target your existing audience. Your email subscribers might not have opened your latest email to see your offer, or maybe they just haven’t responded to the offer yet. This gives them more chances to see the offer. 9. You can target those who have unsubscribed to your email list. When you import your email list to build your custom audience you can include those who have unsubscribed. This provides a soft reminder of your brand and entices them to re-subscribe. 10. You can market based on interests. You can target Facebook users based on the types of things they’ve shown interest in. They might not have heard of your website, offer, or Facebook page, but they’re likely to be interested in learning about them. This raises awareness of your brand and products. 11. Visitors are warm leads. Visitors are reminded of something they’re already familiar with. This isn’t ‘cold’ marketing. The visitor is already familiar with the brand, product, or offer you’re showing them in the ad. This soft reminder might be all they need to return to your website. They’re more likely to recognize and think about the product or service rather than ignore it. 12. You can create and market to a look-alike audience. Creating a look-alike audience allows you to reach Facebook users that have similar interests to your current audience. This helps ensure that you reach an audience that has a higher potential of showing interest in your brand while reaching those who may not be aware of your brand. 13. It helps recover abandoned carts. Visitors can be reminded of products they’ve placed in their carts in your web store. 14. Visitors can see your ad multiple times. It often takes multiple views before someone engages with your offer. Rather than a link they have to open, your message is placed directly in front of them where they can make a decision. 15. It helps build trust for your brand. People tend to think of brands they’ve seen ads for as trustworthy. They might think of shady companies as less likely to advertise. They see companies that reach out to their audience as having their audience’s best interest in mind and are interested in their brand enough to invest into advertising it. 16. You can get traffic through sharing. People love to share what interests them with their friends and colleagues. Facebook ads can be shared like any post. This will grow your reach and spread the news of your ad campaign. When your audience recommends your brand you have even more credibility. 17. It builds social proof. When your ads are shared and commented on, it builds the perceived credibility of your brand. 18. It increases the response rate. By creating an audience to market and remarket to, you are targeting those that are aware of your brand or are interested in the products or services that your brand offers. 19. You save advertising dollars. Since you’re able to target your specific audience you don’t have to waste advertising dollars on those that have no interest in your brand, services, or products. 20. It increases traffic to your website. Your click-through campaign can send lots of traffic to your website, which improves your website’s ranking and brand authority. 21. Stats help you make decisions. Facebook ads include stats on every point so you can better choose and target your audience. You can easily see and analyze the return on your investment (ROI). The ROI can be high and the costs can be low when compared to other advertising platforms. You can reach a lot of potential customers for a few dollars. 23. Facebook ads are easy to use. Although Facebook’s ads have lots of advanced features, the platform is not difficult to use. Facebook marketing and remarketing is a tried and true, and cost-effective, advertising platform that really works. The benefits far outweigh the costs. The ability to target those with specific interests, those similar to your current audience, or those who have previously interacted with your brand ensures that you spend your advertising dollars in the best way possible. On top of that, anyone can create Facebook ads. Do you use Facebook marketing and remarketing? Let us know about your experience in the comments.